Discover the different categories of rooms we have at your disposal at Tivoli Oriente. Our contemporary hotel rooms and suites in Lisbon are designed to meet the needs of the most demanding of guests. Our blue rooms are decorated in classical shades, while our red rooms have a more vibrant and romantic atmosphere. Choose from luxury suites and spacious family rooms overlooking the city or the River Tagus. 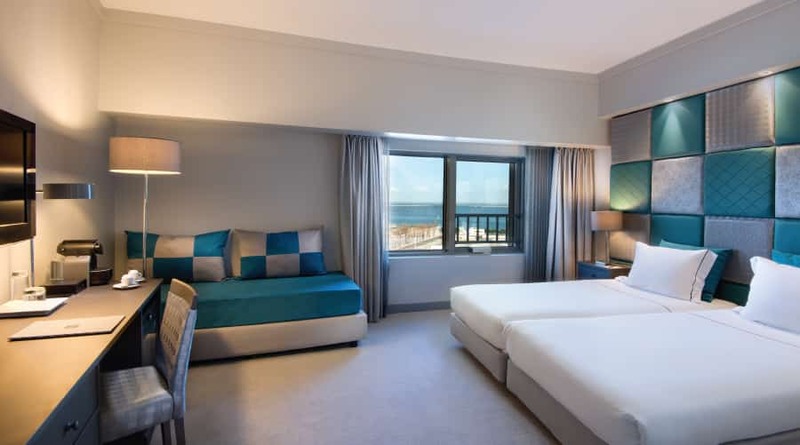 These rooms of around 18m2 are located on floors 2 and 15 of the hotel and have views of the main avenue and the Parque das Nações business area or of the superb River Tagus. They have a single bed, a work space with a desk and chair and a fully equipped bathroom with shower or bath tub. Guests also have a Nespresso coffee machine. These rooms of around 20 m2 are located on floors 2 to 15 of the hotel and have superb views of the city of Lisbon and Oriente station. They have a double bed or twin beds, a work space with a desk and chair and a fully equipped bathroom with shower or bath tub. Guests also have a Nespresso coffee machine. These rooms of around 20m2 are located on floors 2 to 9 of the hotel and have a view of the main avenue and the Parque das Nações business area They have a double bed or twin beds, a work space with a desk and chair and a fully equipped bathroom with shower. Guests also have a Nespresso coffee machine. These rooms have superb views of the River Tagus and are located on floors 10 to 15 of the hotel. Around 20m2 in area, they have contemporary decoration, a double bed or twin beds, work area with a table and chair and a fully equipped bathroom with shower or bath tub. Guests also have a Nespresso coffee machine. These rooms with an area of around 20m2 have a single bed or twin beds and a single sofa bed or extra-bed. With views of the city of Lisbon and Oriente station, the main avenue and the Parque das Nações business area or superb views of the river Tagus, they are located from floors 2 to 15 of the hotel. They also have a single bed, a work space with a desk and chair and a fully equipped bathroom with shower or bath tub. Guests also have kettle and Nespresso coffee machine. These communicating rooms of around 40m2 are located on floors 2 and 15 of the hotel and have views of the city of Lisbon and Oriente station, the main avenue and the Parque das Nações business area or of the superb river Tagus. They have a double bed and/or twin beds, a work space with a desk and chair and two fully equipped bathrooms with shower or bath tub. Guests also have kettle and Nespresso coffee machine. These suites of around 40m2 are located on floors 2 and 9 of the hotel and have views of the main avenue and the Parque das Nações business area With contemporary decoration, they have a bedroom with a double bed or twin beds and an independent living area with a sofa bed for two adults and a centre table. They also have a fully equipped bathroom with shower. Guests also have kettle and Nespresso coffee machine. These suites of around 40m² have superb views of the River Tagus and are located on floors 10 to 15 of the hotel. With contemporary decoration, they have a bedroom with a double bed and an independent living area with a sofa bed for two adults and a centre table. They also have a fully equipped bathroom with shower or bath tub. Guests also have kettle and Nespresso coffee machine. This suite of around 60m2 is located on the 15th floor of the hotel. With contemporary decoration and superb views of the river Tagus, it has one bedroom with a double bed, an independent living area with a sofa bed for two adults and a centre table and dining room. They also have two fully equipped bathrooms with shower and bath tub. Guests also have kettle and Nespresso coffee machine. Ten floors of newly refurbished rooms as well as new Family Rooms to cater for the growing leisure guests. The 11 meeting room Conference Centre has also been completely renovated.